If you follow my work you know that there is a strong inverse correlation between the Gold price and real interest rates. Gold performs best when real rates are declining and especially when real rates decline while in negative territory. Real rates declined sharply into and during 2016 but have been rising or stable this year. 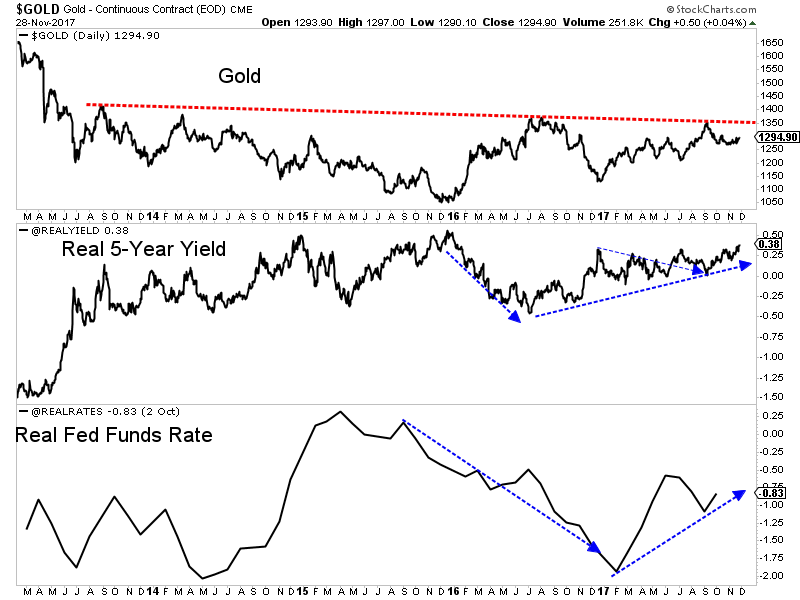 The current problem for Gold is nominal yields have trended higher and faster than the rate of inflation. As we discussed weeks ago, a steepening yield curve (caused by falling short-term rates or rising long-term rates) is bullish for Gold. 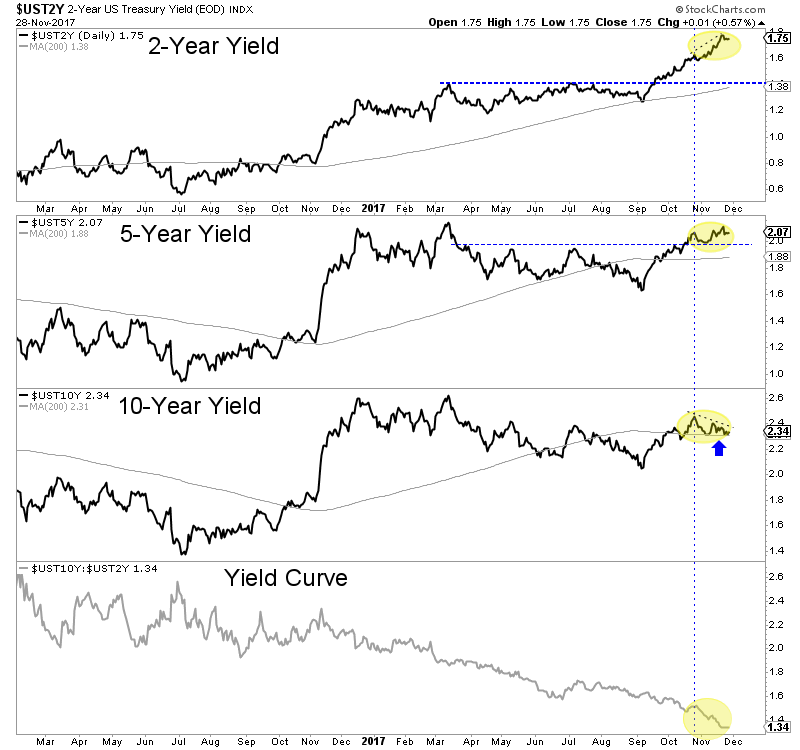 Some gold bugs are excited about a flattening yield curve as it could lead to inversion. While this may be true, a flattening curve is not bullish for Gold. Below we see that the yield curve continues to plunge (flatten) as the 2-year yield has surged and the 10-year is at the same level as two months ago. A bullish development for Gold would be the 5-year and 10-year yields exploding above their March 2017 highs while the 2-year yield arrests its torrid rise. Gold and gold stocks are going to continue to struggle until the fundamentals align bullishly. Market action will of course lead fundamental changes but knowing the drivers to look for can help us anticipate the fundamental changes in advance. We think rising inflation is more likely than falling short-term rates to be the driver for Gold in 2018. In that case, we would anticipate hard assets to perform better, long-term rates to rise faster than short-term rates and inflation to outpace short-term rates. These things would sustain Gold beyond just a few months. In the meantime, the key for traders and investors is to find the companies with strong fundamentals and seek oversold situations with value and catalysts that will drive buying. To follow our guidance and learn our favorite juniors for 2018, consider learning more about our premium service.